1 Bellevue Terrace, Aberaeron - sleeps 8. Belle Vue Gardens is very conveniently situated close to the centre of Aberaeron, and has superb views from the garden, conservatory and first floor balcony across Aberaeron harbour and down to Cardigan Bay. There are 4 bedrooms sleeping up to 8 as well as a travel cot. Bed linen and towels are provided. This beautifully presented, well equipped, centrally heated and double glazed house provides an ideal holiday location just a few minutes walk from the shops, pubs and many restaurants of Aberaeron. Wi-Fi now installed. Regret no pets. Accommodation: There are 3 large bedrooms and one single with a slide out bed sleeping up to 8 altogether, plus a travel cot. The bedrooms include one twin bedroom with TV, en-suite shower room (shower cubicle, toilet and washbasin), on the ground floor making this property very suitable for the less mobile. One double has a TV, en-suite toilet and washbasin and the master double has a TV, en-suite shower room (with shower cubicle, toilet and washbasin), and French doors opening onto a private balcony overlooking the harbour. Bed linen and towels are provided. The family bathroom upstairs has a bath, with a shower over, a WC and a washbasin. The sitting room has a leather sofa with two reclining armchairs, three swivel leather chairs and an electric fire in Victorian surround, plus a 32" flat screen TV with DVD. There are French doors opening onto the rear patio with superb harbour views. The terrace and patio areas are fully enclosed and gated with garden furniture. There are 6 steps down to the lower patio area. You can walk from the garden via a short footpath to the pedestrian bridge over the Aeron River and into the centre of Aberaeron in about five minutes. Regret no pets - this is a pet free property and no smoking is allowed inside the property. There is full oil central heating, and radiators throughout the house. Weekly bookings start and end on a Saturday. 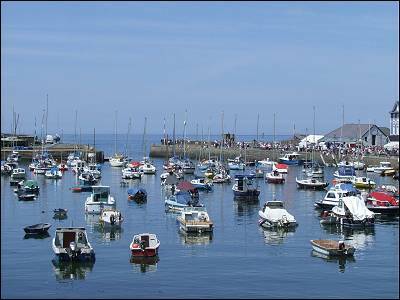 The house is Just a few minutes walk to Aberaeron's shops, pubs and restaurants. Family friendly with a travel cot and high chair on request. 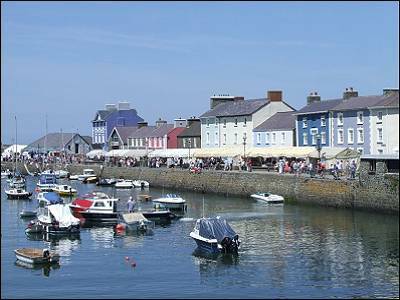 Aberaeron is a charming regency town and with its multi coloured houses, attractive harbour, Hotels, B&B and self-catering Holiday Cottages it has much to offer the visitor. 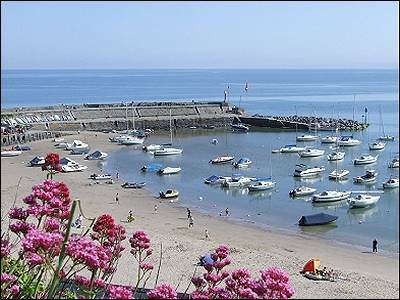 Centrally located on Cardigan Bay, Aberaeron is close to Aberystwyth and Cardigan towns, while Lampeter and Tregaron are a short drive inland through the beautiful Aeron Valley, much loved by the poet Dylan Thomas who lived locally for a while. Coastal Path: The property is virtually on the new Ceredigion Coastal Footpath. To the north the path continues through Llansantfraid (Llanon and then Llanrhystud towards Aberystwyth. To the south is an enjoyable walk to New Quay, Cwmtydu and then Llangrannog.